The precious and unsurpassable teachings taught by the Buddha of our times, Buddha Shakyamuni, have continued from the moment the Buddha first turned the wheel of dharma until today through the very vital and important tradition of transmissions. Kyabje Trulshik Rinpoche bestowing the empowerment of Minling Chokhör at Mindrolling Monastery in 2007. Following the command of Kyabje Mindrolling Trichen Rinpoche, Mindrolling Jetsün Khandro Rinpoche established and guides the Vajra Vidyadhara Project, which is tasked with ensuring that the important tradition of transmissions continues. In receiving the blessings of the empowerment, practitioners gain the opportunity to practice the teachings and also to earn merit for themselves for the benefit of all sentient beings. Kyabje Taklung Tsetrul Rinpoche bestowing the empowerment of Künzang Gongpa Zangthal at Lotus Garden in 2010. 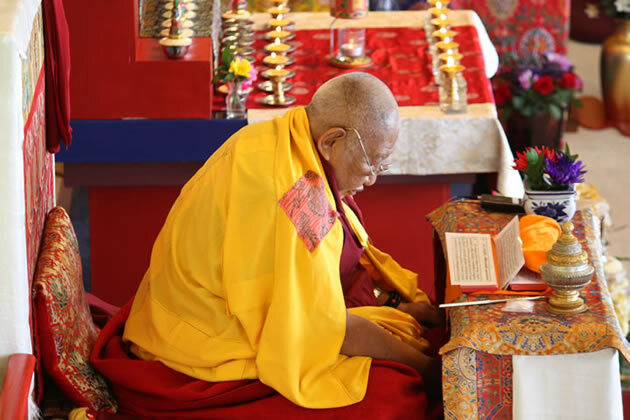 Important transmissions have included the Kama transmission bestowed by Kyabje Taklung Tsetrul Rinpoche at Mindrolling Monastery during the winter of 1997-1998, the Minling Chokhör bestowed by Kyabje Trulshik Rinpoche in 2007 at Mindrolling, the Rinchen Terdzö bestowed by Kyabje Tsetrul Rinpoche during the winter of 2008-09 at Mindrolling, and the Künzang Gongpa Zangthal bestowed by Kyabje Tsetrul Rinpoche at Mindrolling Lotus Garden in the United States in the autumn of 2010.